Click image below to view/download PDF. Scroll down to view benefit details. Every member will provide an email address if available. The email address will then go into Constant Contact which is the mechanism used to notify all members of upcoming events. Event notifications go out several times a month for After Hours, Ribbon Cuttings, monthly luncheons, business education classes and special events. Each member as part of their welcome packet will receive a window cling that states they are a member of the Poulsbo Chamber of Commerce. Members may request additional clings at no cost. Every member will provide an email address if available. The email address will then go into Constant Contact which is the mechanism used to send all members the monthly newsletter. The newsletter will consistently go to the members via Constant Contact on the first of every month. The deadline for the Chamber to receive information for the newsletter is the 25th of the prior month. Each member may attend as many classes as they desire. These will be held at noon on the fourth Thursday of each month at the Chamber office or a local brewery. All Chamber members and Kitsap SCORE affiliates are welcome to attend at no cost. At sign-up each new member is given the option to sign up for the Member to Member discount program. They are given the opportunity to provide a description of their discount which will go on the website on the Member to Member Discount page. Member to Member discounts will be given and received on an honor system. The discount will be listed on the Chamber website for other members to see. Discounts will be given to the recipient by verbal inquiry and request only. Staff of each business giving a discount must be made aware of the discount if one is requested. Ribbon cuttings are open to all new businesses in our community whether they are a Chamber member or not. Ribbon cuttings will occur twice a month, the second and fourth Monday of each month at 5:00 p.m. The Mayor of Poulsbo will be present when possible if the ribbon cutting is within city limits. Non-members will not receive advertising through the Chamber. All new members may have one free admission to a luncheon. All new members will be prompted during the program to come to the podium to talk about their business. The business owner or representative will have 3 minutes at the podium. Chamber members are allowed to be listed under one category on the website. If they choose to be under an additional category, a fee will be charged to up-list. If a business does not clarify which category they desire, it will then be at the discernment of the Chamber staff to place them in a category they deem appropriate. If someone calls or walks into the office and asks for a contractor (for example), the office will find all contractors that are members and refer them – depending on their specific need. The Chamber always gives preferential treatment to members and will always refer them over any non-member. Chamber members are allowed to be listed under one category in the business directory. If they choose to be under an additional category, a fee will be charged to up-list. If a business does not clarify which category they desire, it will then be at the discernment of the Chamber staff to place them in a category they deem appropriate. Each member entitled to this benefit is invited to drop off your marketing brochures to the Chamber office for our Visitor’s Center racks. After Hours events occur once a month on the 3rd Thursday of each month and will be based on a first-come, first-served basis. Each member entitled to this benefit must call the office in order to schedule an After Hours mixer. This will be advertised through Facebook, Constant Contact, the Kitsap Peninsula Business Journal and the Chamber newsletter. It is encouraged that each business hosting an After Hours invites as many people as possible and the Chamber will do the same. Having good food and beverages will encourage a higher attendance. Signage is important, as is parking. Please make sure your guests have access to both. Reservations may be made two years in a row then the member must have a minimum of one year in-between their next After Hours to allow others to utilize this benefit. Each member entitled to this benefit may contact the Chamber office with information pertaining to an event, special, business card, or some other form of advertising for inclusion in the newsletter (up to four postings a year). If a business would like to post additional items, they will be $20/month or $60 for four additional months. Each member entitled to this benefit may call the Chamber to reserve the meeting space in the main office (if it is available) for free once a month, 7 days a week, from 8:00 a.m. to 10:00 p.m. 3 hour max with additional charges after 3 hours. This information will go onto the Chamber calendar and can be viewed by the attendees. An application and waiver must be signed. The Chamber office will hold up to 14 attendees at the conference table. First come, first served. Each member entitled to this benefit may contact the Chamber office with information pertaining to a job opening they might be advertising. This will go onto the website, and in the newsletter if received before the 25th of the month. The member must contact the Chamber office to take if off of the website if the position has been filled. Contact the Chamber office to post an announcement through the Chamber Facebook page. Each member entitled to this benefit must contact the Chamber office two weeks prior to a luncheon in order to be included on the luncheon script. 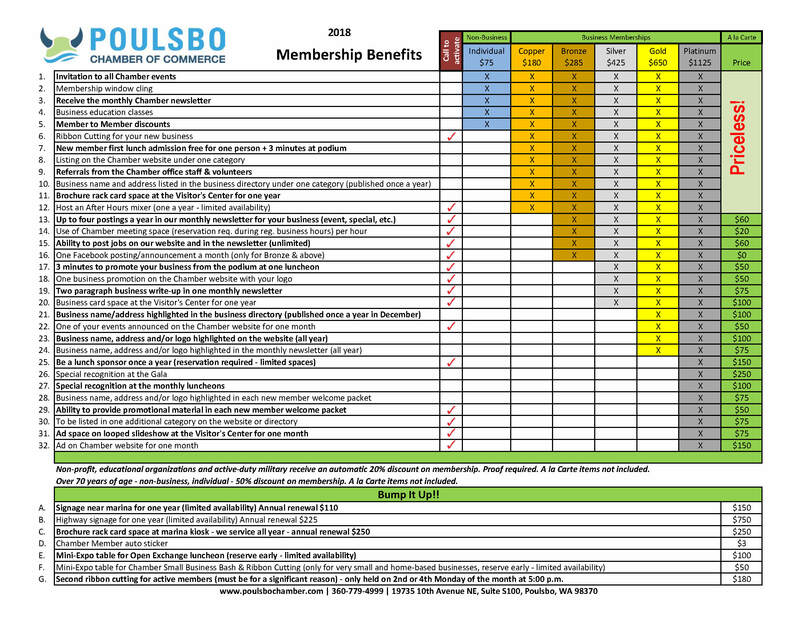 Each member entitled to this benefit may promote their business on the Chamber website with their logo. It is up to the discretion of the Chamber website administrator as to the best location on the website. This benefit will remain in effect from anniversary date to anniversary date for the maximum duration of each paid year. The member must call the Chamber to set this benefit up. Each member entitled to this benefit may promote their business with two paragraphs, their logo and a photo in one monthly newsletter. The member must call the Chamber to set this benefit up. Each member entitled to this benefit will literally be highlighted in the business directory. Each member entitled to this benefit must call the Chamber office to put this benefit in use. It is up to the discretion of the Chamber as to the appropriate location on the website. This benefit will remain in effect for one month or until the event has expired. It is up to the discretion of the Chamber as to the appropriate location on the website. This benefit will remain in effect from anniversary date to anniversary date for the maximum duration of each paid year. Highlighting in this sense may be literal or figuratively and is at the sole discretion of the website administrator. All members must provide a hi-res logo. It is up to the discretion of the Chamber as to location in the newsletter. This benefit will remain in effect from anniversary date to anniversary date for the maximum duration of each paid year. Highlighting in this sense may be literal or figuratively and is at the sole discretion of the Chamber office. All members must provide a hi-res logo. Each member entitled to this benefit must call the Chamber office to put this benefit in use. Reservations are required because of the twelve limited spaces a year. Increasing monthly luncheon sponsors in the future is at the sole discretion of the Chamber. Reservations may be made two years in a row then the member must have a minimum of one year in-between their next sponsorship to allow others to utilize this benefit. First come, first served. Special recognition at the Gala may change from year to year and how it is achieved is at the sole discretion of the Chamber staff and committee volunteers. Appropriate recognition will occur at the event. Special recognition at the luncheons may change from month to month and how it is achieved is at the sole discretion of the Chamber staff, Executive Director and/or President. Appropriate recognition will occur at each luncheon. Each member entitled to this benefit will be highlighted literally or figuratively in each new member welcome packet at the sole discretion of Chamber staff and/or the Executive Director. Each member entitled to this benefit may provide the Chamber staff with promotional material or items to include in each new member welcome packet/bag. This is a great opportunity to get your business in front of all new Chamber members. Chamber staff would be happy to include mugs, caps, pens, brochures, business cards, etc. in each packet/bag. Please call the Chamber office to activate this benefit. We have on average 5 new members a month. If a business provides promotional material, it can be for one month or one year. Each member entitled to this benefit may have their name listed in one additional category on the website or directory. Additional category listings may be purchased. The Chamber main office has a television that can loop your advertisement all day Monday through Friday during regular business hours. Our Chamber office is very active and sees quite a bit of traffic throughout the week. Hi-res logo and/or ad will be required. It is up to the discretion of the Chamber website administrator as to location of your advertisement on the website. This benefit will remain in effect for one month. All members must provide a hi-res logo or advertisement. The Chamber has a kiosk down near the Port of Poulsbo with advertising signage. These signs may be purchased contiguously from year to year. First-come, first-served. $150 initial cost, $110 renewal each year after. A contract must be signed. The Chamber has several monument signs in and around Poulsbo. Anyone that is interested in purchasing advertising on one of our monument signs may do so for a fee. These signs may be purchased contiguously from year to year. First-come, first-served. $750 initial cost, $225 renewal each year after. The Chamber has a secondary kiosk by the Port of Poulsbo that is available to members and non-members for your tri-fold brochures. Chamber staff will make sure your brochures are visible and stocked in the racks year round. Members: $250 per year. Non-Members $430 per year. Are you proud to be a Chamber Member and want to show everyone? We now have auto stickers for you. They will be available at each luncheon or in the Chamber office for $3.